New York City has many wonders and the Park Slope Food Coop is definitely one. 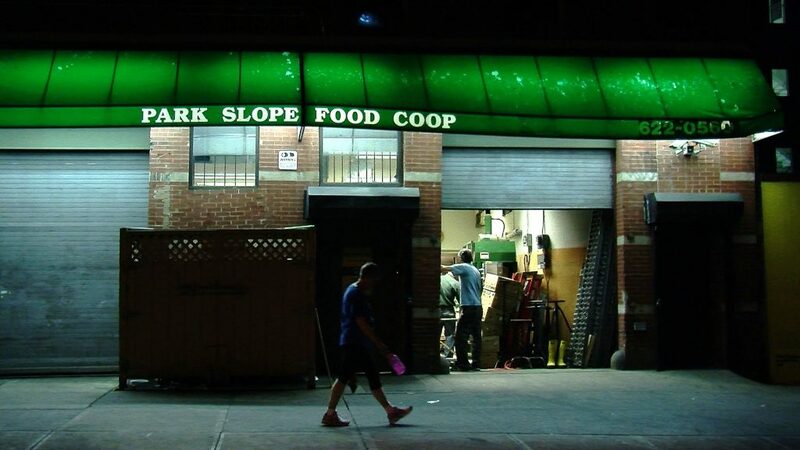 It’s the city’s oldest organic and local food supermarket and it’s mostly run by volunteers. So I was pleased to visit this strange place one day. Not that the concept of a co-op is strange, even in the US. But the fact that in order for me to visit it, I had to be personally invited by one of its members so I could walk around this peculiar market space with a big bright orange badge on my chest that said “Visitor”. And by “visitor” it means: look, but not touch or buy anything. IOhannes M Zmölnig is an active member of the Pure Data development scene. So it’s of little surprise that he was attending the Pure Data Conference that just happened last week in NYC. Pure Data (Pd) is a visual programming language […] for creating interactive computer music and multimedia works. You also might have heard about Pd as an alternative to Max/Msp or VVVV. 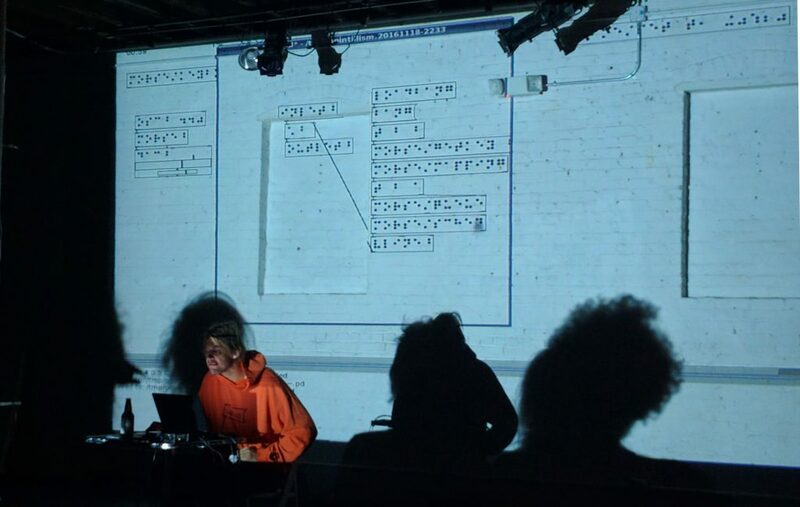 At night, the same people gathered at the Shapeshifter lab in Brooklyn to enjoy live experimental music from some of the participants. And this is where IOhannes blew my mind, friday night, with a performance he calls Pointillism. To explain what is going on, IOhannes is using Pure-data to create a musical instrument. He does this by adding boxes with distinctive functions and linking them together. Everything is done live, in front of the audience, and we can all see what he is doing on a screen cloning his own computer screen. Nothing is hidden. So far, nothing new here. This is often referred to as live coding. Where IOhannes plays a trick here, is that he is writing all the boxes by heart and uses a braille font to display their names. This means that nobody in the audience, and barely him, can read what is going on. Nobody reads braille on a screen anyway. Mistakes in the process are almost not permitted because it would be hard to find where they happened. The music itself fiddles around a theme inspired by morse code (IOhannes told me afterwards the music is actually a reading of the dots of each boxes). And sooner or later, the musical and graphical composition becomes a giant knot of boxes, dots and lines, moving in erratic ways. But all ends beautifully in a rapid deconstruction and closes on a black screen. Needless to say the performer was greeted with a warm applause and had to come back on stage as the crowd would not stop. I’ve rarely seen such joy and amazement in the eyes of the audience at events like this. IOhannes respects all the rules of the genre but with a twists that makes it accessible for people outside of the community. Pointillism is clever, brilliantly executed and a pleasure to watch. I could not recommend it more to any tech festival looking for a original performance and do hope you’ll be able to experience it live some day. Two months ago, I attended a community meetup in NY called Quack & Hack. The point of it was to gather people around coding to improve the DuckDuckGo search engine. If you don’t know DuckDuckGo (DDG) by now, it’s the “search engine that does not track you”. And it’s been my tool of choice when I want to search something on the web. It has nice features like the !bang mechanism and the instant answers which I find really handy. But most importantly, I feel good not being followed by an all seeing eye like You-Know-Who. Another great thing about DDG, is that they have a program called DuckDuckHack where they invite coders to submit improvements to the search engine. These, if approved, end up for example as being new instant answers. I, personally like the weather one, the password generator or the Gimp cheat sheet. But they have many many more. It’s impossible to know them all. So, as a user and fan of Blender, I thought it would be nice to have the crazy number of shortcuts for that open source 3D software directly available in my search engine of choice. It would not only be helpful to me, but maybe also to the larger Blender community. And in the end, it might also have some of those Blenderheads care a bit more about not being tracked when they avidly search for the latest hot features of Blender. In the end, the process of getting those shortcuts live on DuckDuckGo took longer than I expected. But it’s now live since yesterday. 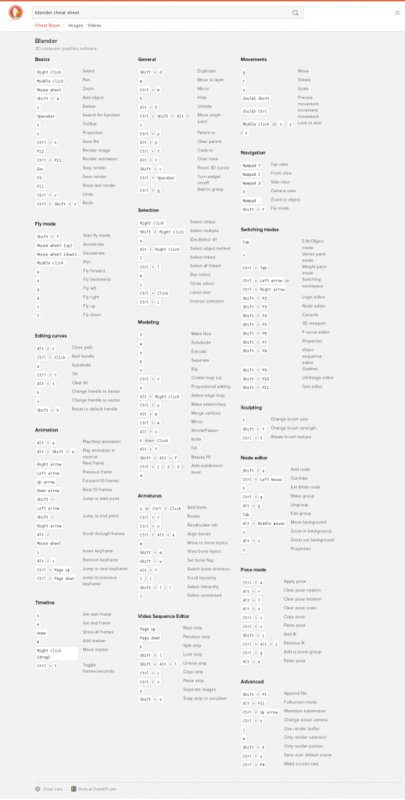 So try it out and search for “Blender cheat sheet” and tell me what you think. You can take a peek at all the effort it took by looking at the conversation I had with the DuckDuckGo team on Github. What mainly happened is that I first submitted a “Blender Cheat Sheet” using the classic way for submitting instant answers and during that period, they were working on a different one, which would be easier just for submitting “cheat sheets”. So I had to port that to the new system, and adapt the code until their new stuff was stable and ready to ship. But I’m glad to have gone through all this. It was an interesting experience to work with the DuckDuckGo team, a nice and friendly crowd. It also feels rewarding to know that my little contribution might hit thousands of users. And I’ll be glad to have that feature in my toolbox when I’ll be giving the next Blender workshop here in NY, at the end of June.